66″ discharge height, 45° discharge angle. Heavy-duty frame constructed of mild carbon steel painted Federal Safety Blue. Carbon steel pour hood with fluidizing pads to promote material flow. 8″ diameter air actuated butterfly valve on pour hood. 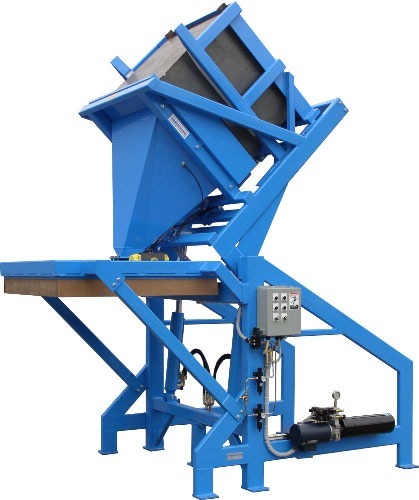 Lift & Seal System™ hydraulically seals container to the pour hood for dust tight discharge. Pivot carriage rotates on a 2″ diameter reinforced pivot shaft mounted in four-bolt piloted flange bearings. Pour hood rotates and docks to fixed box fill head. 3 HP TEFC motor on pumping unit.